In the USA, trampolining was quickly introduced into school physical education programs and was also used in private entertainment centres. However, following a number of injuries and lawsuits caused by insufficient supervision and inadequate training, trampolining is now mostly conducted in specialist gyms with certified trainers. This has caused a large reduction in the number of competitive athletes in the United States and a consequent decline from the earlier American prominence in the sport. Elsewhere in the world the sport was most strongly adopted in Europe and former Soviet Union. Since trampolining became an Olympic sport in 2000, many more countries have started developing programs and China’s program developed World Champion athletes in less than a decade. In addition to the 10 contacts with the bed in a routine, competitors are permitted up to one “out bounce”, a straight jump to control their height at the end of a routine, before sticking the landing. The trampolinist must stop completely – this means that the bed must stop moving as well – and they have to hold still for a count of 3 seconds before moving. A fourth ‘shape’, known as ‘puck’ because it appears to be a hybrid of pike and tuck, is often used in multiple twisting somersaults – it is typically used in place of a ‘tuck’ and in competition would normally be judged as an open tuck shape. Rotation is performed about the body’s longitudinal and lateral axes, producing twists and somersaults respectively. Twists are done in multiples of a half, and somersaults in multiples of a quarter. Rotation around the dorso-ventral axis is also possible (producing side-somersaults and ‘turntables’), but these are not generally considered to be valid moves within competitions and carry no ‘tariff’ for difficulty. 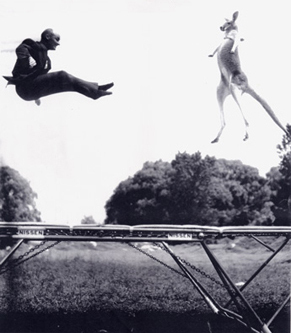 The first individual trampolining competitions were held in colleges and schools. In the early years of competition there was no defined format with performers often completing lengthy routines and even remounting if falling off partway through. Gradually competitions became more codified such that by the 1950s the 10-bounce routine was the norm. The first World Championships were organised by Ted Blake of Nissen, and were held in London in 1964. The first World Champions were Americans Dan Millman and Judy Wills Cline. The first ever televised National Championships were held in England in 1958. Soon after the first World Championships, an inaugural meeting of prominent trampolinists was held in Frankfurt to explore the formation of an International Trampoline Federation. In 1965 in Twickenham, the Federation was formally recognised as the International Governing Body for the sport. In 1973, Ted Blake organised the first World Age Group Competition (WAG). These now run alongside the World Championships. Blake also used the first WAG as an opportunity to organise a World Trampoline Safety Conference which was held in the Bloomsbury Hotel, London, in order to codify safety concerns. There is also a World Cup circuit of international competitions which involves three competitions every year. There are also international matches between teams from several countries. The International Trampolining Federation became part of the Federation Internationale de Gymnastique (FIG) in 1999. FIG is now the international governing body for the sport which is paired with Power tumbling as the skill sets overlap. International competitions are run under the rules of FIG. Individual national gymnastics organizations can make local variations to the rules in matters such as the compulsory and optional routines and number of rounds for national and local competitions. The routines are performed on a standard 14 foot by 7 foot regulation sized trampoline with a central marker. Each routine consists of the athlete performing ten different skills starting and finishing on the feet. The routine is marked out of 10 by five judges with deductions for aspects such as incomplete moves, moving too far from the centre mark, or poor form. Usually the highest and lowest scores are discarded. Additional points can be added depending on the difficulty of the skills being performed. The degree of difficulty (tariff) is calculated by adding a factor for each half turn (or twist) or quarter somersault. Difficulty is important in a routine, and decisions must be made by a coach and performer as to whether it is better to focus on increasing the difficulty of routines, given that this usually results in a reduced form score, or to focus on improving form scores by displaying better form in an easier routine. In recent years, at National / International events an additional score is also added for ‘time of flight’, which is the length of time the gymnast spends in the air during a routine. The official world record tariff for men at a FIG sanctioned event is 18.00, achieved by Jason Burnett of Canada on April 30, 2010 at the Pacific Rim Championships in Melbourne, Australia. The top competitors usually perform routines with a tariff of 16.5 or greater. In 2009 Jason Burnett completed a training routine with a tariff of 20.6 at Skyriders Trampoline Place in Canada. The women’s world record DD is 15.30 by Irina Karavaeva of Russia. The top women competitors usually compete routines with a tariff greater than 14.50. The women’s synchronised trampoline pair of Karen Cockburn and Rosannagh Maclennan also of Canada completed a new world record tariff of 14.20 at the same April 2, 2007 Lake Placid World Cup. In November 2013, the Great Britain Women’s Trampoline Team won gold at the World Championships. This event also saw Kat Driscoll and Amanda Parker win gold medals in the Women’s Synchronised event. The GB team also won the 2016 European title. At the Rio Olympics in August 2016, Bryony Page won the Silver medal while representing Great Britain, which was the first Trampoline medal won by Great Britain at an Olympic Games. This event also saw Kat Driscoll come 6th, while in the Men’s event Nathan Bailey came 9th. The winners of the Women’s and Men’s events were Rosie Maclennan (Canada) and Uladzislau Hancharou (Belarus) respectively. The Double Mini-Trampoline is like two mini trampolines that have been joined in the middle. The first section of the apparatus is set at a slight angle and called the mount. From the mount, skills are performed onto the second section of the apparatus. This second section is called the spotter and is where skills can be performed back onto the trampoline bed or as a dismount onto the landing mat. DMT can be likened to a combination of Athletics, Trampolining and Gymnastics. Competitors sprint down a carpeted track and hurdle onto the apparatus before performing skills such as somersaults, with the same precision required on a trampoline. The main difference is that gymnasts have to land on a trampoline bed less than a quarter the size of a trampoline, before performing a dismount on to a thick landing mat. A DMT competition comprises of four passes by each competitor, two in the preliminary round and then two in the final round. Each pass consists of one skill performed from either the mount or the spotter, followed by a dismount skill, thus making two skills per pass. While Trampoline Gymnastics is an Olympic event, DMT is not currently one of the sports competed in the Olympics.